Intervertebral disk – a structure that separates the vertebrae. It serves to absorb the movements of the vertebrae. Intervertebral disc consists of the so-called pulpal core special jelly mass and envelops the fibrous ring, which consists of fibers. Fibrous ring partially fixed to the adjacent vertebral bodies, and partially – to the adjacent intervertebral ligaments. Some parts of the ring are “free” and there may be some stretching of it. Excess load on the fibrous ring leads to the fact that the nucleus breaks pulpal core break fibrous ring at a greater or lesser extent. This leads to the formation of disk herniation. Disk herniation is the most common and the most severe manifestation of osteochondrosis. Hernia usually sticks out through the posterior longitudinal ligament, i.e. in the spinal canal. This leads to compression of the spinal cord or, more often, the nerve root. It develops ridiculer pain syndrome, which may be accompanied by paresis or paralysis of lower limbs muscles, numbness, and pelvic organs dysfunction. 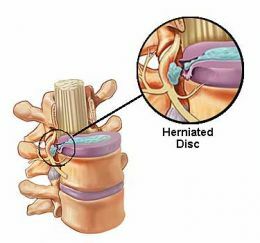 19% of patients with disk herniation require surgery. This entry was posted on Sunday, March 28th, 2010 at 3:40 pm	and is filed under Uncategorized. You can follow any responses to this entry through the RSS 2.0 feed. Both comments and pings are currently closed.